There is a Chinese Proverb, “Give a man a fish and you feed him for a day. Teach a man to fish and you feed him for a lifetime.” Today we might well ask: “Why are the fish not as plentiful as before?” or “Who controls fishing rights?” or even “Why are the fish dying?” We are confronted by the immediate needs of people who are hungry or marginalized. But in our globalized world we also need to address the root causes at the level of politics and unjust social structures. Many problems facing the world in the last century have become increasingly difficult to solve within a nation itself. International treaties and international organizations such as the World Trade Organization, created to address these difficulties, are often perceived as being too centered on the interests of capitalist enterprises. 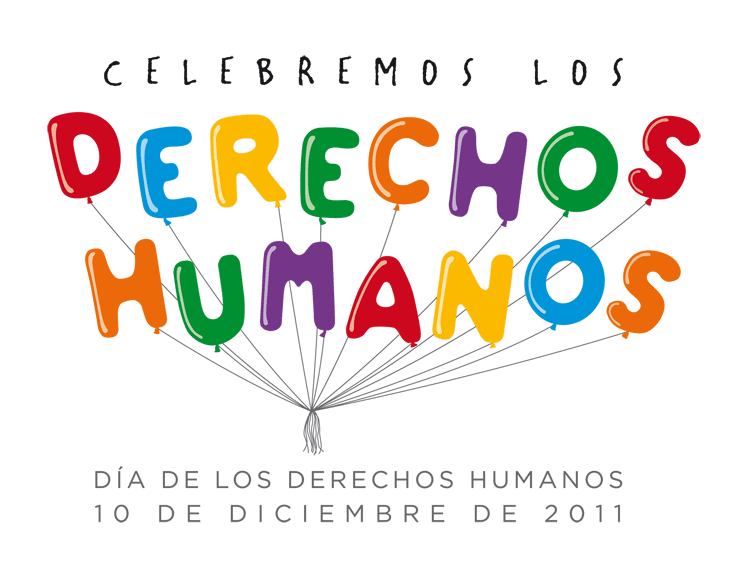 Non Government Organizations (NGOs) have developed to counterbalance this trend and to highlight humanitarian issues, developmental aid and sustainable development when governments and international monitoring bodies such as the UN have been unable or unwilling to do so. VIVAT is taken from the prayer “Vivat Deus unus et trinus…” which is common to both congregations. “VIVAT” means “Let live.” It can be “let the people live,” “let peace live,” “let justice live,” as well as “may God live among us and in our hearts.” The VIVAT logo depicts three persons embracing, welcoming and supporting one another while at the same time looking beyond their own circle to the larger outer world that is longing for unity and communion. The three olive shoots springing from the second letter of VIVAT stand for the hope and the transformation that VIVAT International envisages for the world. 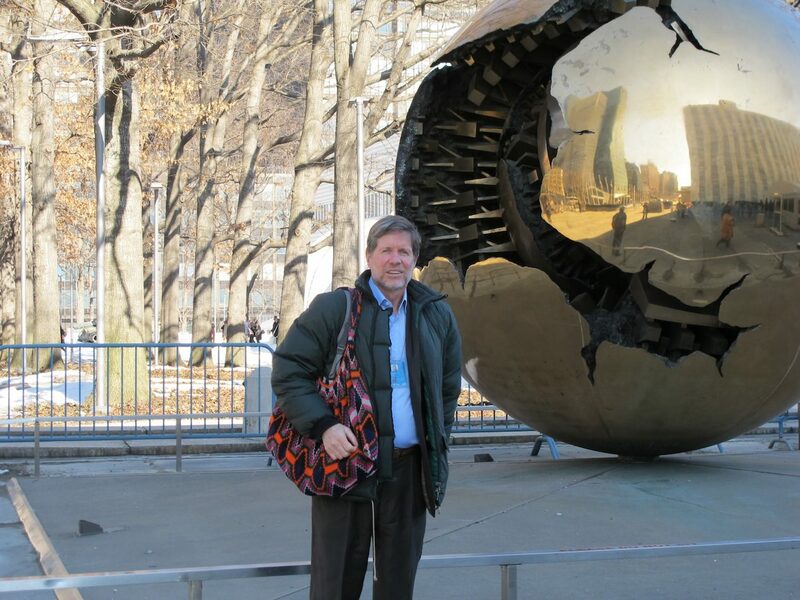 Earlier this year I had the opportunity to spend four weeks with the VIVAT executive team in New York. Felix Jones SVD and Zelia Cordeiro SSpS welcomed me, organized a security pass for the UN complex and arranged that I could attend sessions of the Economic and Social Council and a number of other sessions and gatherings. 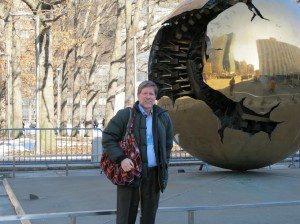 Prior to my coming I had thought of the UN mostly in terms of the General Assembly and the Security Council. So it was an eye-opener for me to learn about so many other bodies within the UN framework, and particularly the way NGO’s such as VIVAT participate in this international forum as advocates for issues that affect people in developing countries. 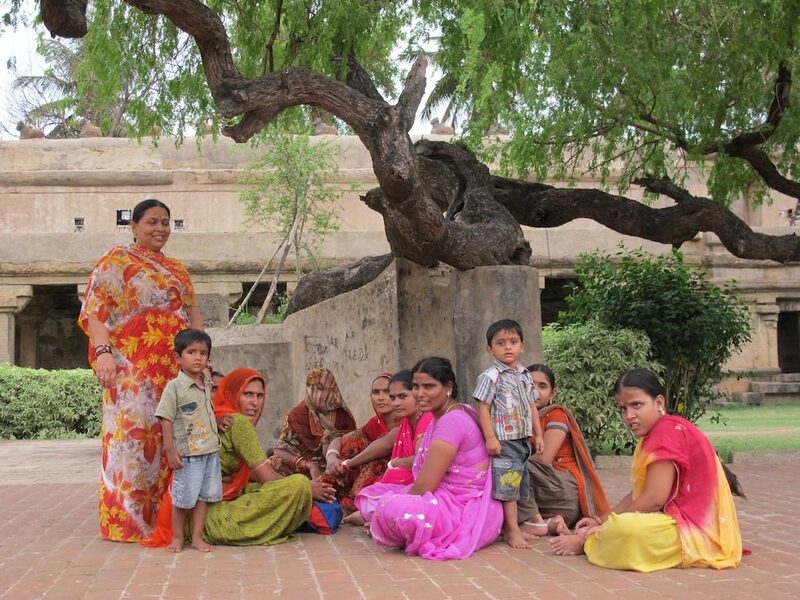 The reality of poverty and inequities, as perceived from communities and grassroots, is different from top-down views. 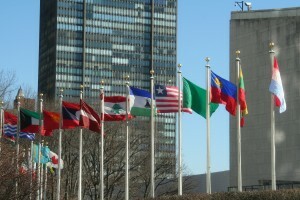 The executive team has a small office on the seventh floor of a tall building in Manhattan, New York; about ten minutes walk from the main UN compound. The office serves as a base for a variety of activities. 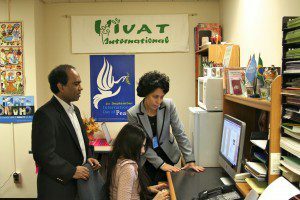 A typical day might start with a short team briefing, attending to urgent correspondence, then a meeting with members of other NGOs concerned with one of the four principal concerns of VIVAT: respecting human rights, eradicating poverty, gender justice, and environmental issues. Afterwards there are reports and the newsletter to prepare. When UN Commissions are in session, such as the Commission for Social Development or the Commission on the Status of Women, the Commission on Sustainable Development, or the Permanent Forum on Indigenous Issues, there are many events to prepare for and attend. 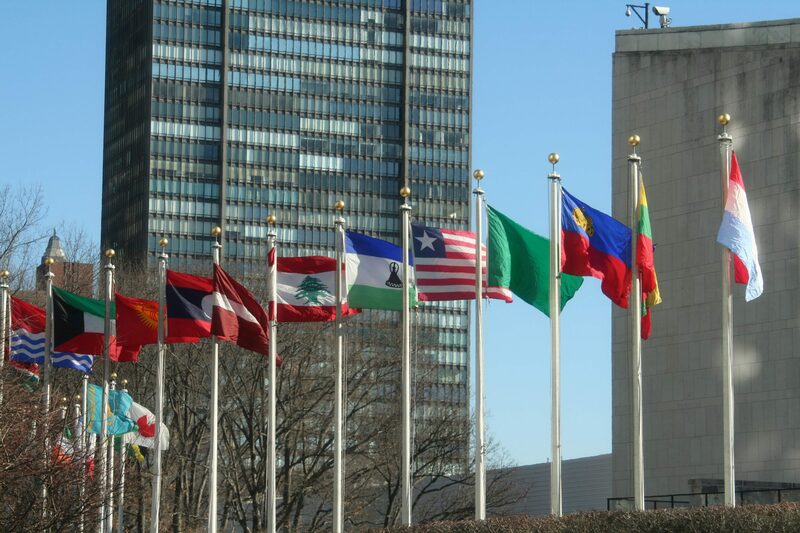 Felix Jones resides in a parish close to the UN. Zelia Cordeiro commutes from her community to Manhattan by bus and metro. Whether in the office or out on different engagements they operate as a team. I asked how they understand teamwork. One said that teamwork means making an effort to put the other person’s ideas into practice knowing that the other does their best to put your ideas into practice. Another said that teamwork is about pursuing a common goal in a positive way. With a common goal it doesn’t matter so much who does it, but that it is done. So it is important to give the other the space and freedom to do their best. It was an educational experience for me to witness those ideals being put into practice. Zelia and Felix are involved in networking with groups and organisations at various levels. On the local level I witnessed how Zelia arranged for translators during a Civil Society Forum at the UN on Eradication of Poverty. She had contacted a number of language schools and received applications from thirteen young language teachers who were prepared to volunteer their time for the demanding task of simultaneous translation into English, Spanish and French. At the end of the day they had done a fine job of communicating ideas in different languages, but also had themselves learned more about the situation of people in developing countries. Workshops are another form of networking. So far there have been VIVAT workshops in Italy, Brazil, Bolivia, Kenya, USA, and Ecuador. Workshops provide insight into the inner workings of the United Nations and its relation to VIVAT, and also allow members the opportunity to share and network with Justice, Peace and Integrity of Creation (JPIC) coordinators, as well as with each other. Workshops also help establish national VIVAT branches bringing new members into the ministry of advocacy and networking at the local level. Networking with the grassroots means becoming involved in advocacy for people such as the Quilombo people in Brazil who are being forced off their land because of dam construction. Quilombos are Afro-Brazilian rural communities – descendents of runaway slaves. Having escaped from slavery, their ancestors formed independent settlements. The Quilombo population has been historically oppressed and marginalized, and proposed dam construction that would generate electricity for a company that produces and exports aluminium, will only further complicate life for them. Already over 230 families have been evicted from their land without any compensation due to the proposed dam construction. The displacement of these communities presents violations of human rights, as people’s lives are completely disrupted. Current VIVAT is taking up this issue with committees at the UN. There are many other issues, for example, the East Flores Provincial Chapter of the Sister Servants of the Holy Spirit have raised the issue of water pollution and destruction of land due to mining in Nusa Tenggara Timur, Indonesia. The environmental pollution affects people’s health, and the land destruction reduces people’s capacity for a sustainable livelihood. The sisters are proposing alternatives such as tourism and new forms of agriculture and fisheries. Many other issues, some associated with the effects of climate change on vulnerable populations, or alternatives to military spending, come to the New York office through the VIVAT network, and the Executive Team and other members in New York try to raise these issues in appropriate forums at the UN. It is a fascinating but difficult task. Accompanying Zelia and Felix I noticed how they would attend meetings extending over several days, listening to the presentations from the representatives of different countries, and then take the time to wait for an opportunity to present a VIVAT perspective on the issue under discussion; or they would go and speak personally with government and UN representatives. They helped arrange for me to visit and talk with the UN Human Rights Advisor, and there was also a chance to interact with Amnesty International, Human Rights Watch, and many NGO groups. VIVAT is not the executive team based in New York. All SVD priests and brothers, and SSpS sisters, are part of VIVAT by virtue of membership in the founding Congregations. VIVAT is growing too as members of the Congregation of the Holy Spirit (CSSp) and Adorers of the Blood of Christ (ASC) are now full members of VIVAT, and Comboni Missionaries of the Heart of Jesus (MCCJ), Missionary Oblates of Mary Immaculate (OMI), Missionary Sisters of the Holy Rosary (MSHR), Comboni Missionary Sisters (CMS), Missionary Sisters of the Holy Spirit (Cssp) and Little Sisters of the Assumption (LSA) have become associate members. The executive team is now networking with 30,000 full and associate members in 130 countries of the world. Letters, emails and the quarterly newsletter are important means of communication. Members in the field can provide grassroots documentation and feedback to the executive team or to the recently established VIVAT office in Geneva. I had conversations about human rights via Skype on several occasions with Edward Flynn, CSSp the VIVAT representative in Geneva. 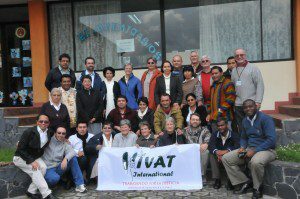 VIVAT is a special ministry and a prime opportunity for prophetic dialogue today. Like most areas of dialogue, immediate results are not readily apparent and it might take a number of years for benefits to appear. Perhaps what I learned most at VIVAT is the importance of faith, patience and bold humility.